First off, automated email marketing is different from sending out an e-newsletter, email blast or one-off email. An automated email campaign, also known as a workflow, is set up to automatically trigger based on a user’s action. It removes the manual labor and haphazard sending companies are often challenged with when first implementing email marketing. And even more important, automated email marketing campaigns capture better click-thru rates and drive more revenue because they are strategically aligned and triggered based on the buyer’s journey. You are sending the right message, to the right person, at the right time. How Do I Start an Email Marketing Automation Strategy? Effective automation is timely, personalized and relevant. It’s more than just a drip campaign of emails that are automated. That means these workflows must start with a strategic approach based on your buyer’s journey. The messaging and timing must align with where the buyer is at in the sales cycle. Also, there needs to be a purpose, a reason ‘why’ you are sending out the emails, and a measurable goal. This is probably the most common type of workflow, as it involves automating a series of emails that nurture leads who aren’t ready to talk with a sales rep. There are various ways to implement these. You can target a list of leads who meet certain criteria or you can nurture leads after they take an action on your website (such as downloading a guide, filling out a form or subscribing to your newsletter). The key to success is setting these up with the right context and right timing. An automated welcome series can be triggered for a prospect who signs up for something on your website, such as an e-newsletter, or for a new customer. While the messaging should be very different for the prospect vs. the new customer, an automated welcome campaign can be used to start the relationship. It keeps the prospect or customer engaged with the brand. For a prospect, it can introduce the company and then trigger a lead-nurturing workflow based on the users’ actions. For a new customer, you can thank them, welcome them to the brand, show them more about the product or service they just purchased and even supply training materials or videos. These types of workflows can be revenue-drivers for ecommerce, especially when they are strategically aligned and personalized based on your customers’ behaviors. For example, this may include product offers based on previous buying habits, personalized promotions for specific dates, such as birthdays, or setting up an abandoned shopping cart workflow. When someone adds an item to their online shopping cart but leaves the site without making the purchase, an email workflow is triggered that reminds them of their forgotten purchase and then offers a discount or incentive to complete the transaction. Automated emails don’t need to stop at the sale. Workflows are also great for staying engaged and continuing the conversation with current customers. This is where opportunity exists for upselling or cross-selling. Automated emails can be used to ensure your current customers have the latest resources and information in hand, know about additional products and services that can provide an even better solution for them and be the first to know when new products and services are released. If you’re attending a trade show or hosting an event, you can send invites, reminders and follow up with attendees via an automated workflow. In today’s online world, reviews and customer experiences are important as people trust them and seek them out online. But for some companies, it’s a struggle to determine the process for getting customer feedback. This, again, is where email automation can come into play. A workflow can be triggered based on the product purchase to ask them for their feedback and review. Not only is this good for online brand reputation management, it can be a spark for a new solution, product or marketing campaign your company had not yet considered. Can Automated Lead Nurturing Get My Sales Rep in the Door? A 2018 Ascend2 Research series on online lead nurturing found that 58% of companies surveyed wanted digital marketing efforts to increase the quality of their leads. Too often, sales is wasting time reaching out to a list of prospects who aren’t ready to talk to them. Instead, automated lead nurturing workflows should be used to nurture and drive prospects down the sales funnel until they are ready and qualified to talk to sales. 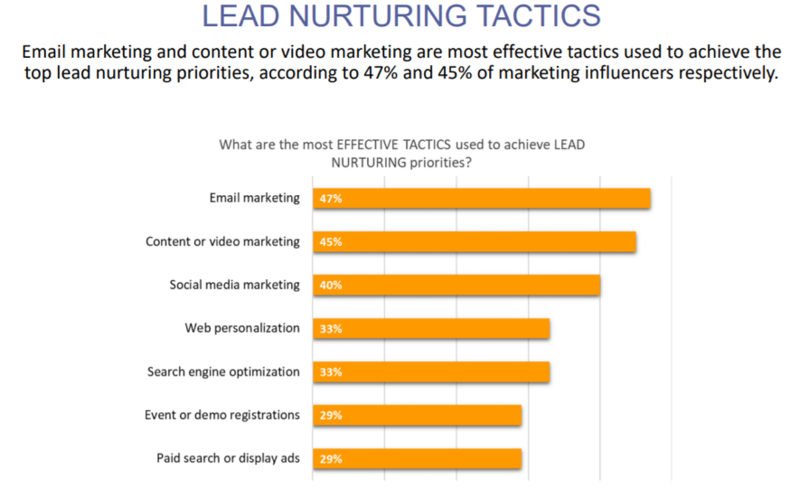 In same Ascend2 Research survey, email marketing was found to the most effective lead nurturing tactic. How Do I Establish an Automated Lead Generation and Nurturing Process? It’s important to note that a lead nurturing workflow must be strategic and aligned between both sales and marketing. To be honest, it’s not simple. It’s complex, but when done correctly — highly effective. Mapping out buyer personas, customer experience journeys and a content strategy. This becomes your strategic roadmap. Aligning sales and marketing from developing the email content to lead management to KPIs. Both parties need to be on the same page. Integrating marketing automation and CRM systems to create efficiencies and closed loop systems so all can see where leads are at in the buyer’s journey. Training sales reps on how to manage digital leads and when to engage with digital leads. A visitor to your website clicks on one of your educational content offers (such as a how-to guide, created after mapping out your customer experience journey to ensure you are providing the educational information they are searching for online). They then provide their name and email address in exchange for this guide, which then automatically enters them into an automated lead-nurturing workflow (using a marketing automation platform). Once in the workflow, the lead gains or loses points (called lead scoring) based on how they continue to interact with your website, emails and other digital content. Additional emails are triggered based on their interactions and lead score. The email content and when to send is based on your buyer’s journey and sales cycle (mapped out and aligned between sales and marketing prior to the workflow being launched). When set up correctly, the workflow delivers personalized emails containing additional educational content offers over a specified period of time. The lead always has the option to accept or reject the offers, which then leads them down different paths within the workflow. The goal is to continually move the lead down the sales funnel until they become a Sales Qualified Lead ready to speak with a sales rep. The automated system (integrated with the CRM) collects the lead’s interactions with your content offers and website activity. Thus, you continually gain new knowledge about the lead that helps you personalize additional content offerings. With a closed-loop system, sales and marketing can see where each lead is in the buyer’s journey, when sales should connect and where opportunities exist — along with being able to track sales conversions, growth and ROI. Your sales team complains that you don’t give them sales-ready leads. You do not segment any of your email lists and everyone receives the same message. You’re collecting valuable lead information, but don’t have a system in place to nurture them to sales-ready leads. The best way to know is to start with a digital audit of your current online efforts. An audit allows you to see where gaps and opportunities exist. We recommend most programs start with some type of audit to ensure you are putting in place a strategy that aligns with what your buyers want and gets the results your company seeks.